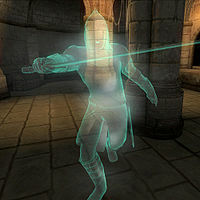 Sir Ralvas is a Dunmer ghost added by the Knights of the Nine official plug-in. He was a Knight of the Nine long ago. Sir Ralvas wears chainmail boots, gauntlets, greaves, and helmet. He also wears a Knight of the Nine Cuirass. He wields a steel longsword in combat. You will meet the ghost of Sir Ralvas in the basement of the Priory of the Nine during the quest Priory of the Nine, where he will give you the quest The Path of the Righteous. After completing the Knights of the Nine quests, his tomb in the basement of the Priory of the Nine grants you Zenithar's Blessing: "Zenithar grants you good fortune. May you always endeavor to become the master of your craft." This blessing gives you an additional five points to your Luck Attribute. This effect is semi-permanent: it stays in effect until you activate another of the Knights' tombs and receive a different blessing. Speaking to Sir Ralvas for the first time will have him pay homage to your accomplishment in beating him in combat, he will also ask that you complete his quest; "You have my tribute, sir knight. In three hundred years, none have passed the gauntlet. In three hundred years, we have never known hope. But for the first time, it seems that someone may succeed where we have failed. I see in you the chance to redeem our souls and restore the order. And now, I must ask you to press forward where I could not. I must ask you to face the challenge of Zenithar." Claiming that you do not have the time for his task right now will have him reply by saying; "Very well. Return when you are ready, and I will tell you of the Mace of Zenithar." Asking him about the Mace of Zenithar after originally claiming that you did not have the time to hear his tale will have him reply; "You have passed our test and now, I must ask you to press forward where I could not. I must ask you to face the challenge of Zenithar." Asking him how he failed in his last quest will have him explain how he failed; "I was arrogant and foolhardy. I sought personal glory. I placed my own will and my own lust for fame over the will of the Nine. In facing the challenge of Zenithar, I failed. I tried dozens -- no, hundreds of times to reach the Mace. I fell each time. And each time I awoke in the chapel, I leapt again. I tried to enlist the help of the other knights, but none would come to my aid. The inscription says to "walk in the faith" but even now, I do not know what this means." Asking him what he would have you do will have him give an inaccurate description of the challenge you face; "Below the Chapel of Zenithar in Leyawiin there is a shrine to the great craftsman, Saint Kaladas. Those seeking the Mace must pray before the shrine. When you bow, you will receive a vision -- or perhaps not. It is unclear. The priests saw that my body never moved, but it felt so real. You will see the Mace, separated from you by a great chasm. The chasm represents your doubt. Your faith must be your guide across it." Questioning his interruption of the challenge that you face will lead to him admitting that he doesn't truly understand the test; "This is what I know. As I said, my faith was weak. I did not understand the test and I fell from the platform each time I tried to cross. I have told you all that I know. All that is left is for you to prove yourself more worthy than I. If you seek the Mace, travel to Leyawiin's chapel, kneel at the shrine in the undercroft, and let your faith in the Nine be the salvation of us all." Asking him about the Mace of Zenithar now will have him tell you what he knows of the weapon's fate; "Legends say that when Pelinal Whitestrake was slain by the Ayleids, a messenger carried the Mace to the human settlement of Leyawiin as a message. Centuries later, the master craftsman Saint Kaladas built the Chapel of Zenithar in Leyawiin as a tribute to the legend. When Saint Kaladas was laid to rest, those who prayed to Zenithar at his tomb began to receive visions of the Mace of the Crusader." Once you have managed to claim the Mace of Zenithar, speaking to Sir Ralvas will have him thank you for doing what he couldn't; "You've retrieved the Mace! I... I can't beleive [sic] it! Sir Knight, I bend my knee in awe at your wisdom. You deserve to carry the mace." Asking him about the Knights of the Nine will have him respond by saying; "Our greed for the relics overshadowed our faith in the Nine. I can only hope that you are stronger than we were." Asking him about Zenithar will have lead to him telling you about Zenithar and his domain: "Of the original divines, Zenithar is thought to be the most in touch with the mortal realm. Some legends say that Zenithar has close ties to Kynareth, an idea that is supported by the manner in which the two gods' realms interact. Craftsmen devoted to Zenithar are able to create and profit from the materials provided by Kynareth's natural world. The two work in harmony -- the natural world providing for the craftsmen. One cannot revere Zenithar without acknowledging the power of Kynareth." Once you have recovered the Gauntlets of the Crusader, asking Sir Ralvas about the gauntlets will have him tell you what little he knew of their fate; "Casimir left with the Gauntlets when the Order dissolved. I heard that he lost them, but I had my own problems to deal with." Asking his fellow Knights about the artifact the he quested for, the Mace of Zenithar, will have them relay to you the fate of Sir Ralvas: "Sir Ralvas quested for the Mace after Sir Berich's betrayal. He believed that with the Mace, he would be able to bring the rest of us together. He stayed in the Chapel of Leyawiin for months, attempting the test over and over. He hardly ate. Hardly slept. In the end, he failed. He left the chapel broken and beaten. Sir Amiel found his body and laid him to rest here at the Priory." This page was last modified on 20 May 2018, at 06:43.